My Perfect Picture Book is below – I promise! 🙂 – I just have a little explanation for it first. As some of you may know, I teach an online picture book writing class. This week, we got into a discussion about subjectivity. As a writer, how do you know if your story will appeal to agents, editors, and readers (both the adults who will read your picture book aloud and the children who will listen)? “Line drawings that look like doodles of cute kittens in gray, orange, white, and blue cannot save this lame tale of a contrary kitten… This is a story of manipulation at its worst. The language is flat, especially when read aloud. This reviewer says “NO!”” Marianne Pilla, formerly at Allard K. Lowenstein Library of Long Beach, N.Y. Copyright 1988 Reed Business Information, Inc. But I don’t find it manipulative. I find it an endearing and true-to-life example of the way toddlers behave – naughty one moment, full of remorse the next, right back to their own agenda the minute after that, but not mean-spirited or malicious in their intent. 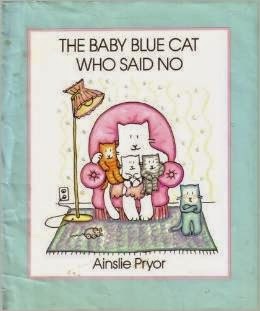 Opening: “Have you heard the story of the Baby Blue Cat who said No? Once there was a Mama Cat and her four baby cats. Links To Resources: Teaching Children A VocabularyFor Emotions; make cards with different emotions pictured and/or written – e.g. a smiley face and/or HAPPY – and play emotion charades by letting kids pick a card and act out the emotions for the rest of the class or family and see if the observers can guess; talk about behavior – have you ever refused to do something just to be difficult? Do you sometimes do bad things and then feel sorry? Talk about how to say you’re sorry – resource HERE. PPBF bloggers please be sure to leave your post-specific link in the list below so we can all come visit you and see your fabulous picks for this week! Oh, and P.S. The lovely Alayne Christian invited me to be part of her platform building series, so I will have a post on her blog tomorrow if anyone cares to stop by. She deserves lots of visitors, and there are other (undoubtedly much better :)) posts in the platform building series already published from Julie Hedlund, Miranda Paul, and Tara Lazar, as well as more coming from Katie Davis and I think maybe KidLit411 – so definitely worth checking out the series! In Which Phyllis Bestows Prizes For Her Birthday Bonanza Winners! My first novel is praised in some reviews as a great find and in others as something that should be hidden away. You're so right about subjectivity. Today's PPBF pick sounds like an adorable gem worth checking out. Thank you so much for sharing about it. That's why we need so many PBs. . .there is something for everyone. Cute story! And I can't wait to begin your class. Next week, right?? Baby Blue Cat is a leader. I love his show of independence as well as his love of his mama. Great book for toddlers. This sounds timeless and priceless. I was, of course, never like Baby Blue Cat! I love the term baby cat instead of kitten, too. Okay- I am TOTALLY intrigued now. Gotta pick this one up – and let you know what I think! That Baby Blue Cat sounds like every cat I know! It looks like a cute book to me! The cover is adorable, so I think I would like the illustrations. This sounds like a fun book. I will be checking it out. Thanks for the review. Haven't seen this one but it looks promising. I love how you started because it's so SO important for us to keep perspective and point of view in mind when reading reviews. I thank you for the full disclosure. And I now want to read this book to see where my own subjective opinion lies.